Fatdog: Here's a new series of top quality custom basses that Romain is building and assembling out of alot of old stock and parts, like Alembic, Warmoth and Bartolini. 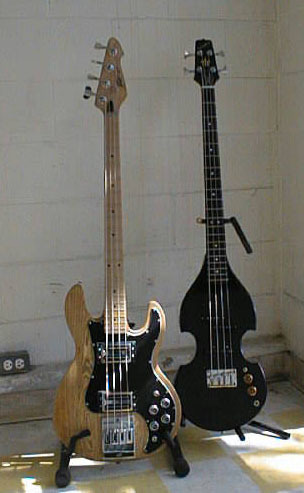 I call it a new world/old world fusion, combining to make these new basses. Romain's a real good musician, and he's fond of Alembic and Bartolini electronics. Romain likes Alembic pickups so much, he's building alot of these basses with the Alembics installed. 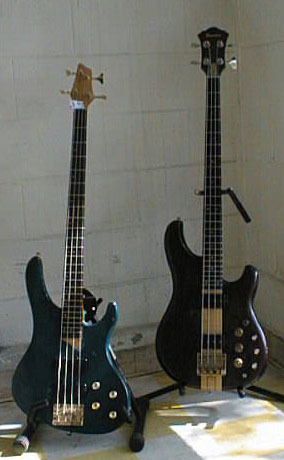 Romain: I wanted that set up, but you can't find it in France -- only Bartolini -- not Alembic pickups. FD: He's having a field day, wallowing in Fatdog's endless stash of old parts, building whatever he feels like. He's building each one as if it were his own dream. 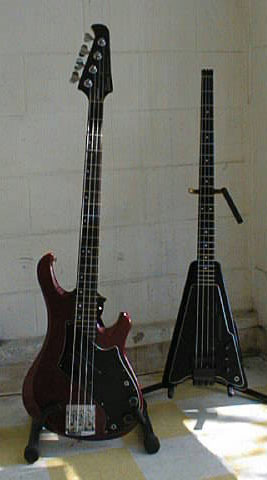 Romain: Perfect coordination between the body and the pickups, makes for a much better jazz bass. A real Alembic doesn't give the possibility to slap that I want; the Alembic doesn't allow me to be free, as I like. FD: Because there's no room because of its design and construction. Romain: Fatdog's solution. The first thing that I noticed when I came to the shop was to see that Yamaha bass with Alembic pickups. I couldn't help but try it. It feels perfect to me. 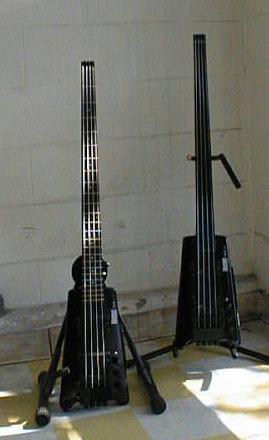 Also, those 5-string Oden basses -- which are really good: you can hear the definition of the lower B strings, all the way up to the peghead -- to F -- which you hardly hear when you have a modified bass. Well, you've got it, but you have to have a special attack. For example, Trace Elliot has done a head with a real EQ -- for the 5th or 6th strings lower.... But what you need is a way that you can fit in any amp. Versatile. Romain: The Oden bass -- as it is -- with this Alembic pickup and also the way its set, can give perfect tone. For example, if I want to record on stage, I know I won't have to have a certain EQ or DI box to hear my lower strings back down there. It hardly buzz. FD: And the reason? 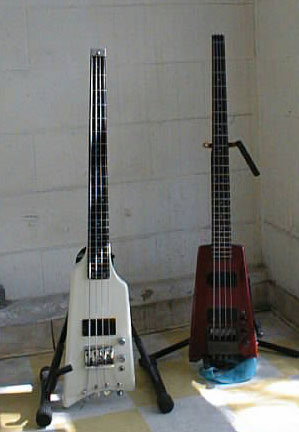 Its the geometry -- the neck angle and the geometry of the basses you're making, make it so that it works. 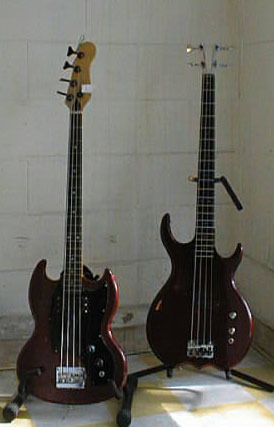 On the Alembic, bass strings are too close to the body. Romain: For example, if I were playing an Alembic, I would automatically hit the pickups. They're really great instruments -- don't get me wrong; but they were made a long time ago, in a time when nobody was really slapping -- it wasn't an issue then. Absolutely. FD: In fact, we have an Alembic bass that somebody routed out a big trough in there, just for slapping. They sortof defaced the instrument to get that effect. This has to be filled in because they routed channels -- took alot of the wood away under the strings -- so you can slap it. FD: What you have here is the synthesis of the old classic Fender-style with more of the modern Alembic electronics -- and playability. Romain: For example, if I want to slap the Alembic, there is a buzz happening down here. There's no room. I hit metal pickups. Even if you were to adjust the bass, the string of the bass, it will be too high to be on time for a certain kind of lick. But the Alembics electronics are TOPS. Really, really top. Its the best -- after Fender, they're the BEST. FD: And its also cheap. 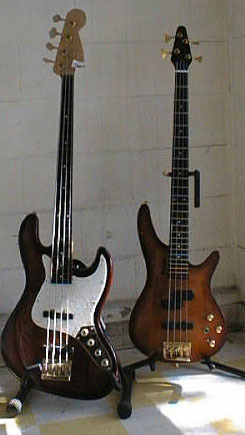 All these instruments are a fraction of what they would cost if they were made by Alembic. 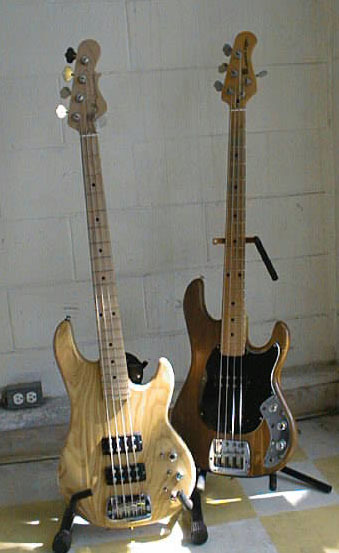 And these are constructed using USA Warmoth quality wood, and Bartolini active tone circuits. turquoise alder body, maple neck, Alnico pickups, maple control plate. Chocolate alder body, Alnico jazz bass pickups, birds'eye control plate. Birds'eye maple and ebony fretboard. sissy lines. Ash body, Alembic pickups, ebony control plate, Bartolini NTBT active tone. USA ebony fretboard and control plate. Alnico pickups and black hardware. Ebony fretboard, Bartolini pickups and koa body. 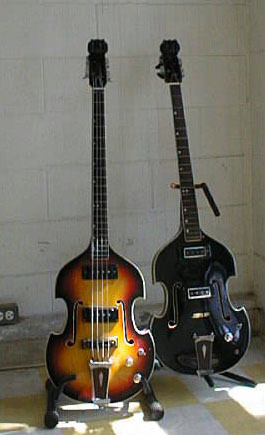 Great custom bass! built by Romain Dru. with Fender neck, Gotoh gears, Alembic jazz bass pickups and Bartolini NTBT active tone. Fender neck, Gotoh GB-7 gears and EMG jazz bass pickups. Warmoth neck, ebony fretboard with sissy lines. Alnico jazz bass pickups and ebony control plate. something a New Jersey dentist extracted and something that fell off of an Austin Powers set. Alembic has the most definition of sound. For example, when you go on stage, you want to play that hit. When you send the sound by the monitors source, you still hear your note, its not loose. So on top of the bass you've got alot of electronics active. When the sound guy sends the sound back, as soon the band plays, you don't hear yourself anymore. The sound is already EQ. You want to have a neutral kind of sound, which gives perfect freedom to put some color in. Its a kind of electronic thing. I saw Stanley Clark and George Duke -- on stage -- in 1983 in France. That sound was what I mean. I'm really a great Stanley Clark fan, he's a great contrabass player, but I'm more into Larry Graham. Anyway, I could hear that same sound. He had this Alembic -- a really beautiful one -- with lights for the fret marks. That was something specially made. When he did this particular lick, there was this incredible definition, filling the whole room with his sound. You could hear every little sound so clear. It was -- WHOA! really amazing. Stanley was really the best, using the Alembic sound. Johnny Crystal was good, but Stanley was really more. 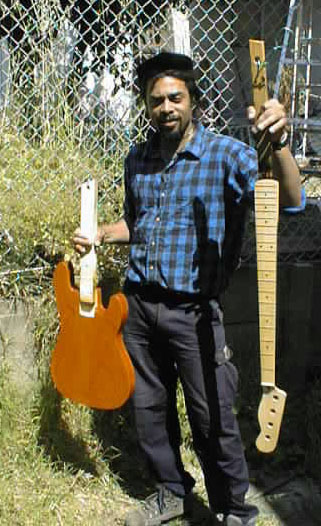 For that matter, Stanley Clark is the Alembic EXPERT. When you hear all the recordings that he's done -- from the 70s and 80s -- especially one called Rock, Pebble and Sand -- he really put the bass up front. He even said how he did it. You can really hear the Alembic sound. Its definitely Alembic, Alembic, Alembic. He's been using a really special recording of it. What he did was really very simple: He took two big speakers -- some kind of mark like Electrovoice -- and he put those two in different rooms with mikes on. Some of his bass was going straight into the mixing board, so. Of course, when he played, the full sound of the bass was going straight through the decks PLUS what was going to those cabs. It also gives like a really heavy thing. 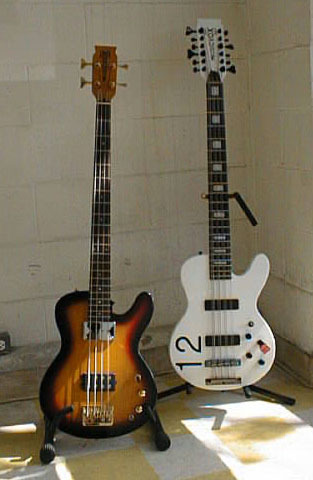 I've got to say: These basses will really blow your mind.